Home / Political News / Current News / Why Indians are happy? It is surprising to note, from day one since registration of the no-confidence motion against Prime Minister KP Sharma Oli, the Indians started to express their happiness. Reports state that the Indian diplomats were throwing dinner parties at different hotels in Kathmandu. Similarly, the dailies publishing from Delhi were found covering reports about Nepal’s political developments. They didn’t forget to mention that after topple of the Oli’s government, India’s relations with Nepal will gain a new height. When PM Oli was addressing the Parliament here before he announced his resignation, the Indian newspapers close to the establishment were found expressing happiness on ousting of Oli. Oli was projected as a person involved in anti-Indian campaign. Even before Oli was elected to the post of the Prime Minister, the Indian establishment was not happy with Oli. After endorsement of the 16-point agreement among the major three parties – NC, UML and the then CPN Maoist under the initiative of Moist supremo Pushpakamal Dahal – India was unhappy. After endorsement of the 12-point agreement between the then seven parliamentarian parties and the then underground Maoist party in New Delhi under the initiative of the Indians, India had felt that she has become the commanding power in the Nepali politics. The Indians made their reach up to the micro-management level in Nepal. The sudden endorsement of the 12-point agreement without consultation of the Indians and changed instance of Oli and Dahal made the Indians angry. Indian Prime Minister Narendra Modi sent S Jaishankar, secretary, Indian External Affairs Ministry to Nepal as his special envoy. The secretary had urged to postpone the constitution promulgation date for some weeks. The then PM Sushil Koirala was positive, although, both Oli and Dahal tried to humiliate the special envoy in a rude manner saying that the constitution promulgation date cannot be postponed. Humiliated Indians decided to impose economic embargo against Nepal. The reason is that the Indians believe the constitution was being promulgated under the influence of the West and thus they were very hurt with the two leaders here. Furthermore, Indians wanted two provinces covering all the tarai districts by excluding the hilly districts. The pro-Indian tarai based parties were launching agitation for this cause. Thus, India has not regognized the present constitution yet. Indians tried to stop Oli from becoming the PM by giving instruction to Sushil Koirala to challenge Oli’s candidature to the post of the PM. Alas, the Indians could not stop Oli from becoming the PM. When the very India empowered leaders started to challenge the Indians, obviously, such behavior must have hurt them. Since then, the Indians were trying to topple Oli government. Without using Dahal, it was impossible to topple Oli. Therefore, according to Narayanman Bijukche, chairman of the Nepal Majdoor Kishan Party, Dahal could face serious life threat if he would disobey the Indians. 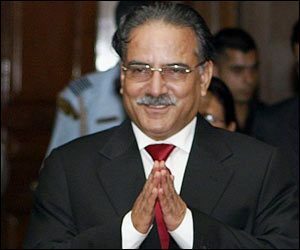 Therefore, Dahal was compelled to accept the Indian plan to topple PM Oli. Bijukche further claimed that Deuba visited Delhi and in the meantime, Maoist leader Keishna Bahadur Mahara also visited Delhi to receive Indian directives. Then after, the plan to topple Oli was materialized. Two months ago, the plan was going to be implemented but during that time, the Indian plan was unsuccessful as Dahal was unable to take stance against Oli. However, this time, Dahal and Deuba have become the Indian instrument to oust Oli from the PM’s chair.